" Considering it is very much needed by residents"
"Previously we repaired sidewalk and bridge," expressed Jakarta Bina Marga Agency Head, Hadi Nugroho, Tuesday (2/12). Nugroho disclosed that street repair uses conblock and bridge repair uses iron material by adding railing on the right-left side of the bridge. "Street is repaired up to 36 meters length with 2 meters width. Then for bridge is repaired up to 34.5 length with 2 meters width," he told. 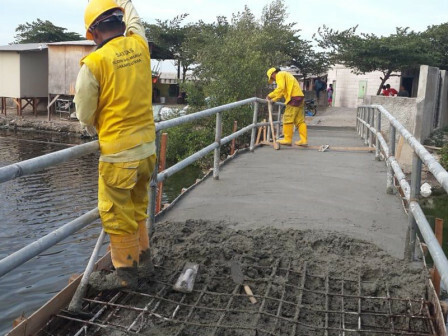 His side is currently revitalizing the 28-square-meter pier, which is targeted to be complete by the end of this month. "Considering it is very much needed by residents," he said.